The proud mother and her other children have been getting a first-hand look at all of the festivities happening in Panama through photos and videos from her son. “That makes me feel so good,” she said, smiling. Her daughter, Hillary, was excited for her brother and the experience he has been able to enjoy. “He’s going to learn a lot about God, and get closer to Him,” she said. On Saturday night, the Tellos joined others from the diocese at Presentation of the Blessed Virgin Mary parish, Jamaica, for a World Youth Day viewing party. 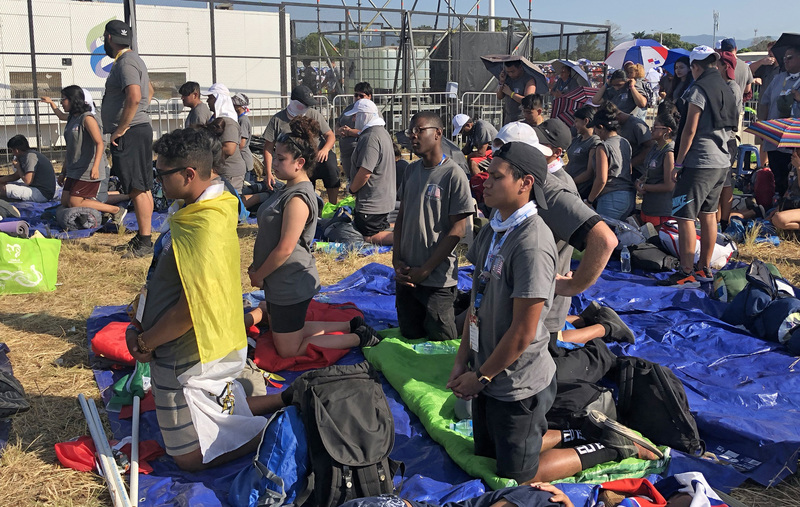 Attendees were able to watch and listen to Pope Francis’ vigil with young pilgrims at the St. John Paul II Field of Metro Park in Panama City. One of the event organizers, Laura Ramirez-Galeas, is a two-time international World Youth Day veteran. Because of her incredible experiences, she wanted to make sure that the rest of her community had some idea of what it felt like to be a part of it. “I can’t describe it,” Ramirez-Galeas said. “When you’re there, you don’t need to speak, you just know who you are and that you belong there. “People don’t understand that we belong to this immense church, it’s not just the church that we go to go across the street. No, we are the Church,” she said. In Jamaica, about 80 members of the Church in Brooklyn and Queens – from toddlers to teens and even senior citizens – came out for the viewing party, looking to feel some of the same sense of community as the young people gathered in field nearly 4,500 miles away. “Even though we are not close together in the same place, we are one in spirit,” said event co-organizer, Claudia Cruz.